Let it snow, let it snow, let it snow! Well, maybe not. A white wintry wonderland is lovely, until you have to shovel your walkway to get to your car or the street. And that's not the only home snow removal task you have to worry about. There are a number of areas around the house that demand your attention when the weather forecast calls for more flurries ahead. 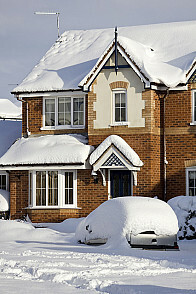 Find out how to cope with removing snow. Here's the thing: steps are much simpler to shovel if you're standing at the bottom ... which, of course, raises the question of how you get to the bottom when your stairs are blocked with a fresh layer of snow. Why not clear a small channel so that you can get down the staircase and clear the rest from ground level? An electric snow shovel will make the work much kinder to your back. Treads or mats on the steps will help cut down the slipperiness. Keeping a disability ramp free of snow is top priority. However, as a disabled individual, you might not have readily available help for removing snow off your only egress from the house. An above-the-surface electric snow-melting mat can be a literal lifesaver in these circumstances. If possible, switch the mat on half an hour before a snowfall is predicted and leave it on for a while even after the storm so you don't end up with a huge icy puddle on your ramp. A serious cause of winter accidents is balancing on a ladder, trying to get the snow off your roof. While this is an important home snow removal task when the accumulated fallen snow comes close to your roof's weight limit (usually 40 pounds per square foot), please do it safely. A roof rake which uses a pushing motion is much safer and more efficient than a standard shovel. The best part is that you can do all the work with both feet planted firmly on the ground. Counterintuitive though it may seem at first glance, your deck can handle a hefty load of snow much better than your roof. Building code tends to specify a weight limit of 60 pounds per square foot for deck construction. That translates to a 5 foot depth of lightweight fluffy snow, or 3 feet of wet snow. Nevertheless, promptly removing snowl mean the load on your deck is less likely to come anywhere near the danger point. It also ensures that you have a functional second emergency exit from the house if your back door opens directly out onto the deck. A broom is fine for a light dusting; for heavier snow, utilize a plastic shovel that is less likely than metal to scratch your decking. A light snowfall will not harm bushes and trees on your property. Heavier amounts of snow, however, may cause branches to break, especially with evergreen species. Gently brush the snow off with your gloved hands or a broom. (Kids might enjoy this task -- just make sure they don't get overenthusiastic!) Remove any large broken limbs so they won't damage your property in a storm. Encourage strong, healthy branch growth by having a professional landscaper prune shrubbery in the late winter to early spring. If a shovel works to clear your walkway, it should do the trick on your snow-covered car or truck as well, right? Maybe so, but it just might ruin the vehicle's finish in the process. If you're not in the mood to shell out for a new paint job, stay away from that shovel and any bristle brush. Opt for a non-abrasive molded polyethylene foam brush; it'll be much safer for your vehicle and your wallet. Best is a model with a telescoping handle, which you should use to carefully pull the snow off from the top down, in long straight lines. A coat of wax or a fabric car cover will help protect your wheels when the next snowstorm hits.